Indian designers are set to explore the rich heritage of India through ‘Weaves of Banaras’ at Make in India Week. While fashion guru JJ Valaya said it’s a chance for him to showcase his long-standing relationship with the city, Anju Modi stressed that she is committed to revive and promote Indian crafts across the world. Veteran designers are all set to showcase new-age Banarasi weaves at the Fashion Design Council of India (FDCI)’s ‘Weaves of Banaras’ as part of the Make in India Week, which will be held in Mumbai on Sunday at the ITC Grand Central. 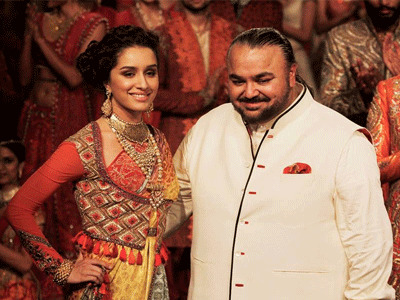 This is an initiative which will see how a modern interpretation by design geniuses like Sabyasachi Mukherjee, Rohit Bal, Rohit Gandhi and Rahul Khanna, Rajesh Pratap Singh, Namrata Joshipura, Ashish Soni, Arjun Saluja, Anita Dongre, Abraham & Thakore and Abhishek Gupta apart from Valaya and Modi, changes the innate structure and architectural shape of an ensemble. Talking about his collection, Valaya said: “Varanasi and I have had a long standing relationship. From our very first collection to what we are showing here, we have been intertwined at the very roots. Namrata Joshipura added that for her, it is an honour to be associated with the Make in India initiative as it is a great platform to showcase the uniqueness of Varanasi. “We believe that this show will bring greater awareness of this wonderful craftsmanship,” she added. “In this capsule collection, it has been engineered and woven according to the fit of modern garments that makes it more relevant for the younger generation,” he said.